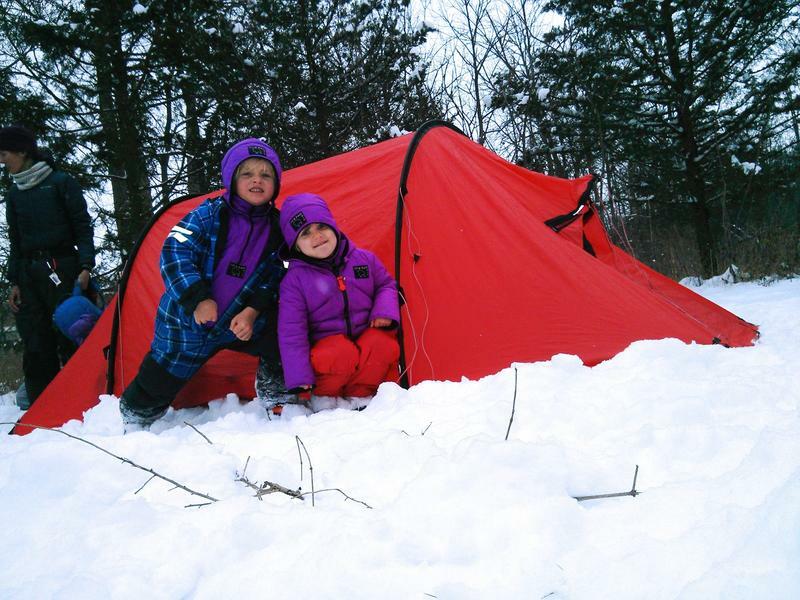 The Green Room: Learning Without Walls - Local Programs Where The Outdoors Rules! Kids spend less and less time outside. With the bitter cold these past two winters, many retreated inside even more. And now, as snow has morphed into mud, kids are cautioned to stay clear of that too. But some alternative educational programs are bucking the trend: based in nature, their kids are outside most all of the time, even in cold or wet weather. In this installment of WEMU’s “The Green Room,” Barbara Lucas visits several of these local programs to see how they do it, and why. Barbara Lucas (BL): Some people jump through hoops for their job—a 20 degree morning last month found me squeezing through a small opening, into a snow cave. Inside, I join five children and their teacher at Blossom Home Preschool in southeast Ann Arbor. Child: This is where we always come for morning circle. BL: There’s no whining here about the cold—the children are all snug in warm clothes. But I’m not as well-prepared. Children: Those are not really warm gloves. They are thin! We have waterproof gloves! BL: Indeed, they seem impervious to the bitter cold as work to create a window in the cave, busily taking turns drilling through the thick wall of snow with a big metal auger. Children: This turns around. Barbara watch! I’m making a hole. See where that hole is? That’s where smoke comes out. I’m going in to see if that is the hole over there. Jeannine, I see a little tiny hole in there. I got it I got it I got it! Children: Ice Mountain! Ice Mountain! Jeannine Palms: They spend hours climbing up and down it, making all these games, and with no toys whatsoever! They learn all kinds of things about how to relate with each other and how to move their bodies. BL: Jeannine Palms owns Blossom Home Preschool. She feels too much time inside can have negative repercussions. Palms: One of the remedies for ADHD is for kids to be outside for half an hour, and they’ve seen huge differences. But kids don’t even walk to school anymore! BL: But it’s not all undirected free play. Palms: This is the very first “Childrens’ Wet Meadow,” built in ’97. BL: Do the kids come out here and play in it? 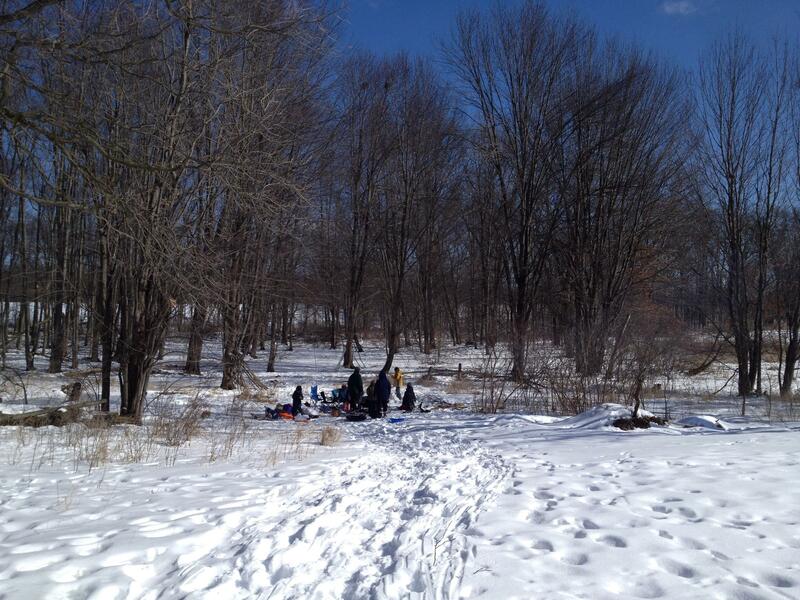 BL: Do early years of learning about nature, in nature, make a difference later in life? Here is former Blossom student Yousef Rabhi. Yousef Rabhi: After a rain we would go out and follow where it fell and where it flowed and into the storm drains. We would go to the creek and we’d check out the sediment and we’d check out the insects and we'd see all the connectivity of how everything was impacted by the whole creekshed, basically. BL: We’re in a greenhouse at the Matthei Botanical Gardens where Rabhi is Volunteer Programs Coordinator. He’s also a Washtenaw County Commissioner, and says this ecosystem view of how everything affects everything else has carried over into his work in politics. Rabhi: It’s a huge part of how I make decisions. BL: He says his preschool years influenced his decision to major in environmental studies in college. Rabhi: I had prelearned a lot of the things that I then learned again in college, in preschool, which I thought was pretty cool. BL: I ask him if his preschool years would have been so influential if they’d been indoors. Rabhi: Absolutely not, it really couldn’t have. We wouldn’t have been able. What I remember, I don’t remember the time we were inside. I remember the time we were outside. 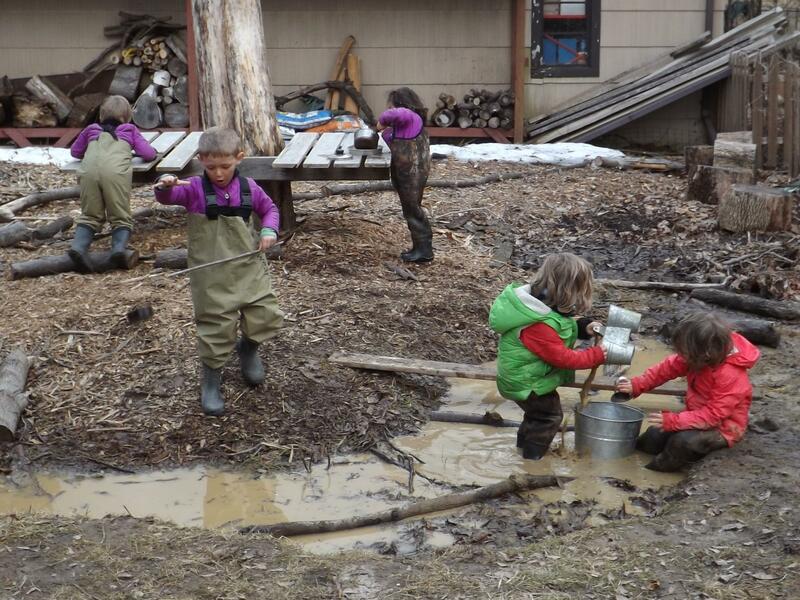 BL: In Europe, preschools that are held outside regardless of weather are called Forest Kindergartens. While common in Germany and Scandinavia, they’re only a handful in North America. Why so slow to catch on here? Tara Habeck: Most of the challenges are, it is labor intensive, there’s a lot of planning that goes in. But once you are prepared, you are going to have a great day. BL: Tara Habeck is owner of Florecita Forest Kindergarten, which is right next door to Blossom Preschool, and spends even more time outside than does Blossom—nearly 100%. In fact, they carry a tent with them wherever they go, to eat snack in, and to protect against the elements. BL: In rainy weather her yard turns into a mud puddle paradise. She points to six pairs of kid-size insulated waders, ready for action. For cold weather, she requires each family to rent from Florecita a full uniform of multiple layers of specialized outdoor gear. Habeck: This blocks winds up to 40 or 50 miles an hour, and it’s extremely light. And it has a nice soft plush in it. This pile, if some snow gets in the neck, or if a child is sweaty, it wicks moisture, and dries extremely quickly. BL: Jason Ledbetter is a parent—he loves how the gear allows his children to enjoy playing outside, regardless of the weather. Jason Ledbetter: I like to get them outside, so they don’t look at a screen all the time, and can run around and use up more energy. 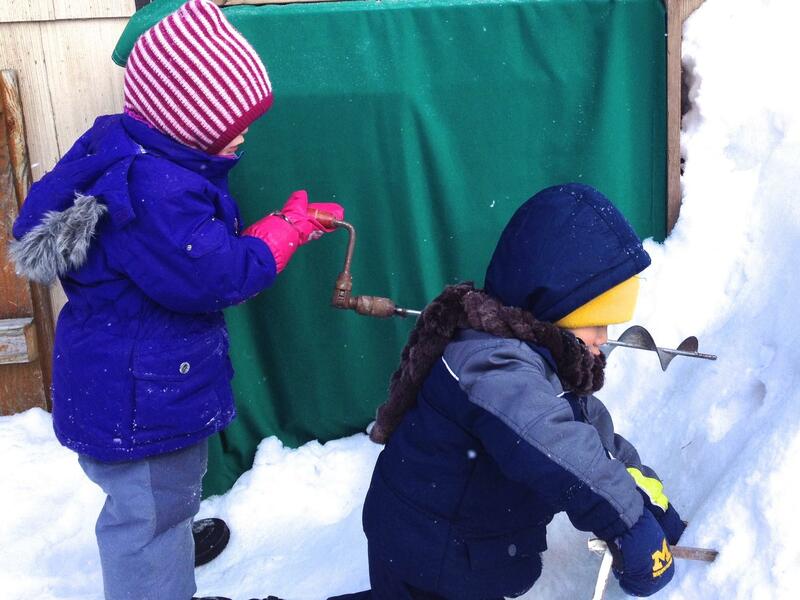 And in Michigan, I want them to be winter sportsmen, so for their whole lives they will enjoy the cold and the snow. 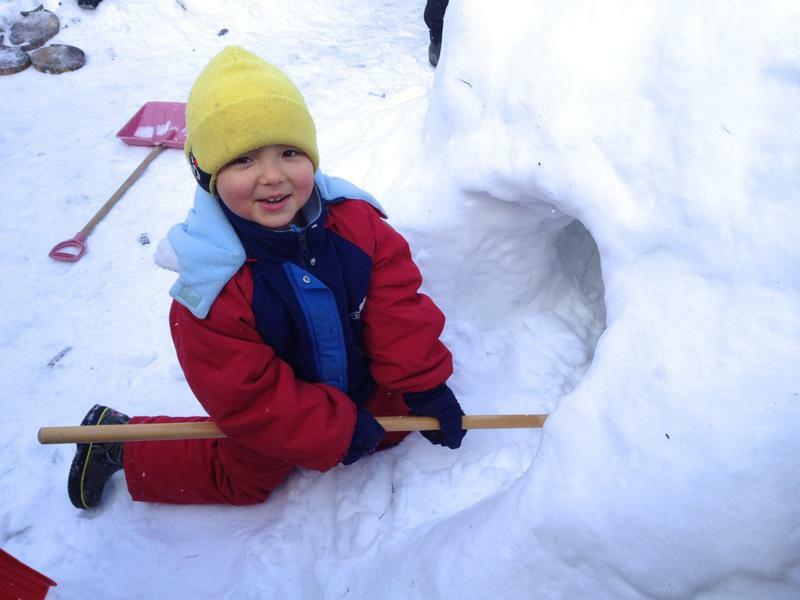 BL: Ledbetter feels the outdoor play has multiple benefits. Ledbetter: First of all they learn better balance. If you learn to balance when you are little, I think it will stay with you for your whole life. BL: Habeck says the kids learn physical skills at their own pace. Habeck: Climbing the “Porcupine Trees,” the three year-olds, they’ll start at the bottom and maybe they can’t even get up. And they watch the other children. And the larger children will come down and help them and show them the way. And they’ll get a little bit further. And by the end of their second year here, they are in the top of the tree! BL: While age six is the oldest at Blossom and Florecita, there is a local once-a-week outdoor program for home-schoolers age seven to twelve. It’s called “Coyote Nature Explorers” and it’s run by Rowena Conahan of the Nature Learning Community. Rowena Conahan: See how I’m trying to make sure there is a mass of tinder above the heat spot? That’s where the flames are going to go, if they go. As long as there is smoke, there is something alive in there. BL: We’re in a woods that’s blanketed by snow. 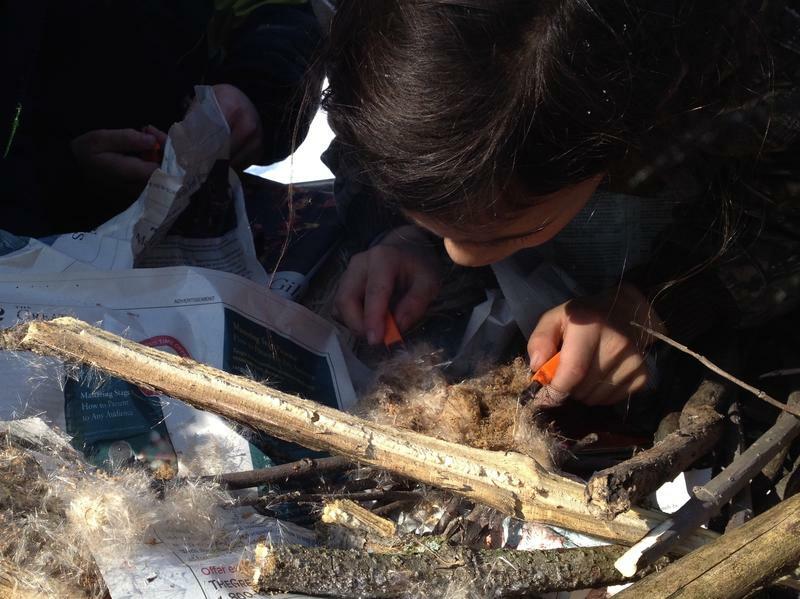 Conahan is giving tips on lighting a fire without matches—by catching sparks from flint onto a tinder of dried weeds. A daunting task even for adults, the main ingredient seems to be persistence. Children: It’s really smoking. No, we need that under—fire goes up! BL: But after about a half hour, sure enough! Children: It’s lighting, I got it! BL: Now the kids can roast their snack over the fire, on sticks they’ve whittled themselves. BL: Gail Quarton is here today with her two grandsons. She’s noticed a big difference in them, after attending this program. Gail Quarton: They have an unbelievable appreciation for the natural world. BL: She’s wary of the current focus on electronic, indoor play. Quarton: When I grew up, we could live outside, and we did! I’m really happy to have the kids have this, because it’s their version of being able to do that. Quarton: I think once they start, they don’t want to quit, because it feels right. It’s part of their nature. BL: The freedom to play, explore and learn in nature is fast-disappearing. But from these local programs, it appears it can be a safe, and valuable, part of children’s lives.